When you need to move a dresser, it can help to disassemble it first. This makes it more compact for storing and it can be moved around easier. Additionally, you won't have to worry about whether it will fit through your front door. Taking apart a dresser is a relatively straightforward process. Taking apart a dresser is a relatively straightforward process that requires only a few tools. Keep in mind that all dressers are slightly different, so while this guide offers general suggestions, be sure to refer to the assembly instructions that came with your specific dresser before you start to take it apart. Empty the dresser completely. Remove any clothes or other items in the drawers and from the top of the dresser, as well. Slide the drawers out of the dresser. Start with the top drawer and slide it out as far as it will go. On most dressers, you will have to lift up the drawer slightly at the end of the slide rail to remove it completely. Repeat the process for the remaining drawers. Lay the dresser face down on the floor. Remove the back panel. On many dressers, the back panel is nailed in place. Use a hammer to carefully pry up the nails. Be patient and use gentle pressure to avoid damaging the back panel. There will likely be several nails around the edges of the back panel. Start in one corner and work your way around the dresser. Remove the top cover. 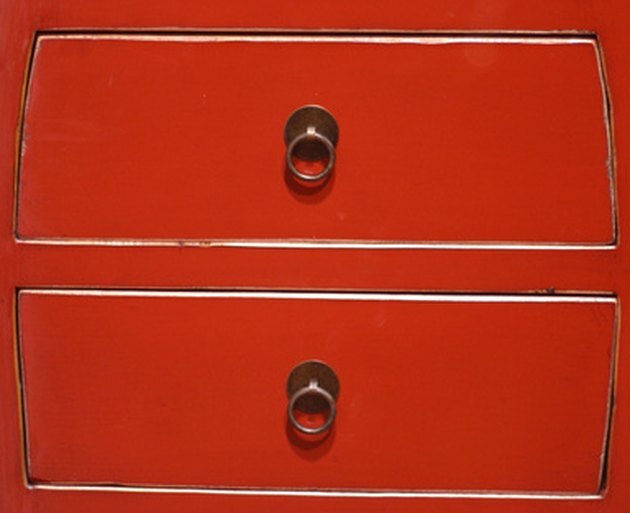 Most dressers use four locking nuts to hold the top cover in place. The nuts will be in the four corners of the of the dresser where the top cover meets the side panels. Simply turn the nuts counter-clockwise to release the top cover. Lift it off the dresser. Remove the left side panel, which is typically attached to several cross bars on the dresser. The cross bars hold the left and right side panels together and provide stability for the dresser. The left panel will be attached to the cross bars by the same type of locking nuts used on the top cover. Turn the nuts counter-clockwise to unlock the panel. Start with the bottom cross bars and work your way toward the top, supporting the left panel with your hand as you go. Once all the nuts are unlocked, lift the left panel off the cross bars. Unlock and remove the crossbars from the right side panel by repeating the same method used to remove the left panel. Remove any pegs or posts from the crossbars, top cover and side panels. The pegs may be wood or metal, depending on your dresser. Wrap the peg in cloth to protect it and then grip it with a pair of pliers. Gently wiggle the peg out of the hole. Repeat the process until every peg has been removed. Place all the pegs and locking nuts in a plastic bag for safe-keeping.